Firemen extinguish the remains of a fifth wheel camper Sunday afternoon. 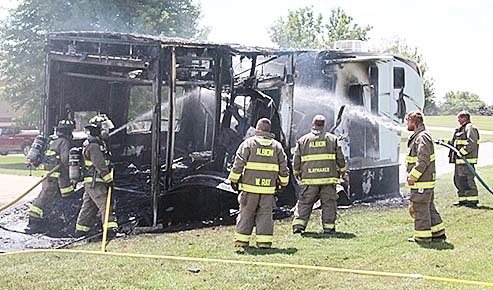 Fire destroyed a large fifth wheel camper in Albion early Sunday afternoon, June 17. Albion Fire & Rescue was called to the scene on 11th Street, south of Highway 91, shortly after 12 noon, arriving to find the trailer nearly totally engulfed in flames. The driver, Scott Wiese, had seen the flames as he was approaching Albion on Highway 91 from the west, and pulled onto 11th Street. He was able to park the camper and disconnect the tow vehicle. He was also able to remove two ATVs from the rear of the trailer. The driver said the fire apparently started in the roof area of the camper. The fire was extinguished in a short time. Details in the Albion News June 20 Print and E-Editions.